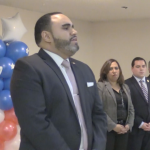 Seeking a third term this spring, West New York Mayor Felix Roque unveiled his re-election slate this afternoon, with the opposition team dropping off 5,000 petitions for nomination minutes later, in a clear sign that the race is starting to heat up. “The first thing I said to myself: I gotta find somebody that has always been there throughout, catering to the community – taking care of them,” Roque said at a press conference in his office this afternoon. The first running mate he introduced was Department of Public Works Commissioner Susan Colacurcio, who has stuck with the mayor ever since a split amongst the board of commissioner occurred in the middle of last year. Noting that taxes have been stable throughout her first term (she served as the Revenue and Finance commissioner for just over three years), Colacurcio said she didn’t mind the split since DPW has been “neglected” in her eyes. 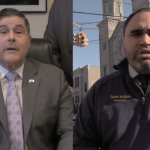 Colacurcio’s remarks were a veiled shot at Public Safety Commissioner Gabriel Rodriguez, the head of the New Beginnings West New York slate who served as DPW commissioner while she was in charge or revenue and finance. While Roque alluded to Colacurcio being “bullied” by other officials, declining to go into details, the 15-minute or so presser, was overwhelmingly positive, focusing on issues such as stable taxes and a consistently low crime rate. Sticking with their campaign slogan of “Continue the Progress,” Roque’s new running mates explained why they decided to join the cause. “I care about this community: this is my town, this is our town. I want to make sure that the residents of West New York have safe place to be … in this community I’m involved in a lot of kids sports,” said Board of Education Trustee Maite Fernandez. “As a supervisor of the [West New York] Rent Control Department, I have learned the concerns of the residents – fellow residents that need a lot of help,” added first time commissioner candidate Ana Luna. 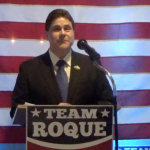 Richard Acosta, who unsuccessfully ran for the board of education in November, echoed the sentiment that Roque’s administration has brought positive change. “This has been a great opportunity here with this mayor and commissioner, with the progressiveness that they’ve done, and continuing the progress forward, with this town. With the quality of living, they’re doing an amazing job,” Acosta stated. When HCV asked Roque how he felt about the popular mindset that this election was really about him against U.S. Rep. Albio Sires (D-8), he decided to take the high road. “The reality: I’m not fighting anybody. I quit fighting when I did my 36 years in the army, John. That was it. Now, I’m working, to embrace him, and everybody who wants to do a positive change, to West New York,” he said, reiterating this campaign was about moving forward. Not to be outdone, NBWNY, who announced their candidacy 22 days ago before officially kicking off their campaign on January 18th, made their way to the Town Clerk’s Office about a half hour after Roque’s presser had concluded. “We’re very happy to be here today. 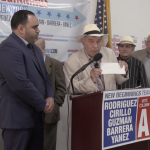 We just submitted our first batch of petitions, 5,000, to be exact – by no means the end of what we will be submitting,” Rodriguez said in front of Town Hall. “This campaign kicked off just over two weeks ago and it’s a real testament to how great the community is backing this team. We have real public servants here and you can see it,” Department of Public Affairs Cosmo Cirillo added, noting the quick petition turnaround. Rodriguez at first played it coy when asked when the press event was scheduled for today, after Roque’s announcement, noting that it was a nice day and that Valentine’s Day is just around the corner. When asked directly what he thought of Roque’s team, Rodriguez took a swipe at his rival. Commissioner Margarita Guzman is joining Rodriguez and Cirillo, as are first time candidates Victor Barrera and Yoleisy Yanez. The West New York municipal elections, which will ultimately decide the next mayor, are on May 14th. Big mistake Richie.. You already look sorry in this video. Don’t be Roque’s puppet or stooge. He hurts anyone and everyone that joins him in the end. WATCH YOUR BACK! FELIX ROQUE is WORSE THAN FIDEL EVER WAS! ASK SILVIO ACOSTA HE WORKED FOR FIDEL….omg Richie are you related to that criminal Silvio? Titanic is sinking. Women and children first! Nicole and Anthony D.. no Rats on the life boats.